Colorful new children's pillows featuring graphic animal designs from Chandler 4 Corners get positive reception from parents and kids alike! 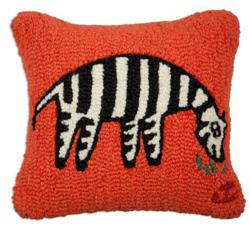 This zebra is one of the popular animals in the new collection. We felt there was something special… a quality that reflected the simplicity of childhood, an innocence that seems to be harder and harder to find in our over-connected world. Chandler 4 Corners has a reputation for fine hooked wool pillows with seafaring dogs and rustic pine cones and classic Adirondack chairs. Now they have expanded from the family room to the children's bedroom with a line of fun, graphic pillows geared to 3 to 6-year olds. "Julya's Designs," as the new collection is called, is fresh territory for the established home accents company. So far, the collection includes 12 whimsical and colorful animals—a zebra, a monkey, an alligator, and more—that have just the right kind of appeal for young children. Julya’s Designs is named for the artist behind the line: Julya Chapman, a fresh, young Colorado designer. The new pillows are distinct from the rest of Chandler’s merchandise, all of which is designed by Laura Megroz. Julya’s pillows are made in the same careful, hand-hooked manner as the rest of the C4C products, but have a decidedly childlike, almost magical, quality to the style. Brothers Henry and David Chandler, President and Vice President of Chandler 4 Corners were enthusiastic but still somewhat unsure about the new line. They had a good feeling about it but also some concern. With an unknown designer and a product outside their usual arena, they couldn't predict how the line would be received. “We really felt there was something special in her designs, a quality that reflected the simplicity of childhood, an innocence that seems to be harder and harder to find in our over-connected world. 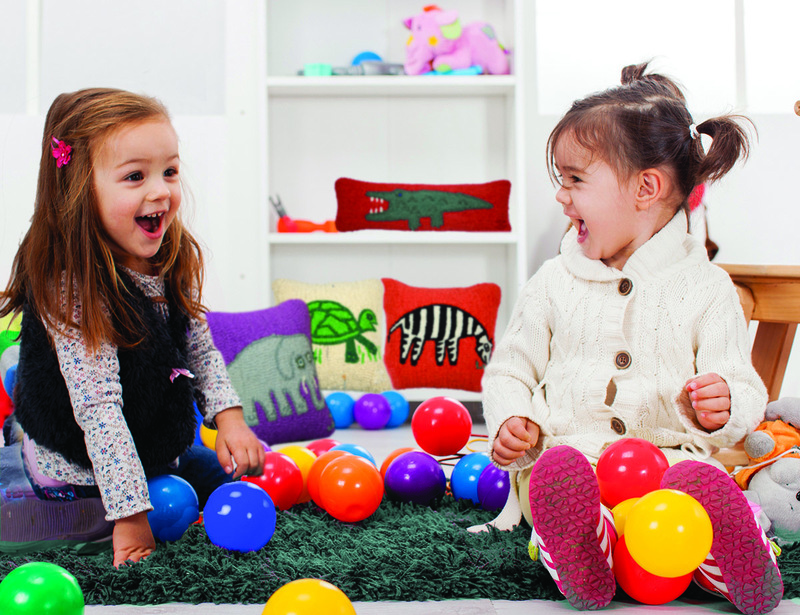 The positive response to the pillows indicates that many parents agree!" said company president Henry Chandler. Julya’s Designs are available at chandler4corners.com. Chandler 4 Corners has been offering pillows, rugs and household accents since 1995. Based in Manchester Center, VT the company sells to retail shops, leading catalogs, and individuals across the country. Chandler 4 Corners hand-hooked products are made of pure wool in custom colorways and suit any decor. It's easy to see how well the new pillows fit with young children.